My name is Mark Goddard. 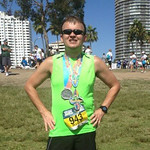 I design software as a profession and love to run to stay fit. Photography is my opportunity for artistic expression. I hope you enjoy my work. I welcome any comments or questions you may have.